A Girl and Her Zebra Plus Making Mistakes = ? the opportunity to make better paintings. I’ve discovered scientific studies that back up my theory that practice painting increases your painting skills. 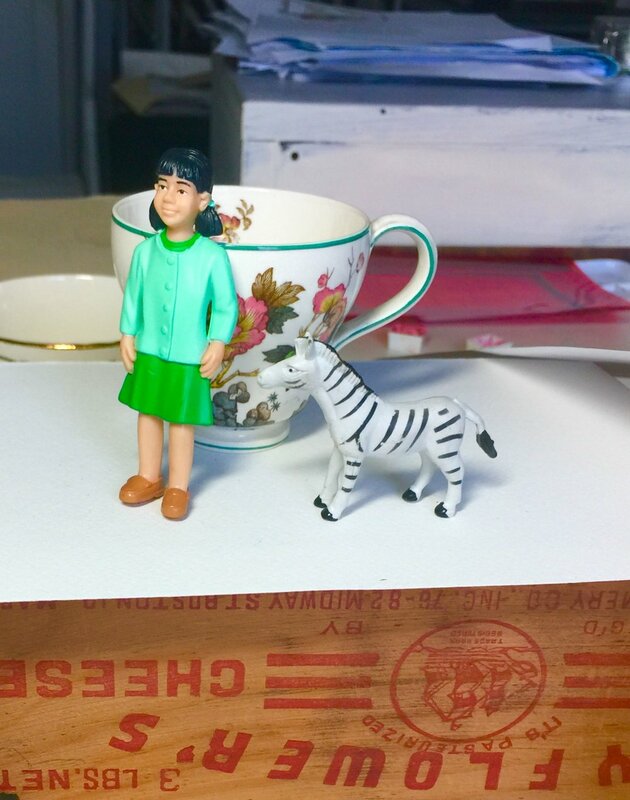 I mentioned last week that my muse had texted me to paint subjects from my plastic animal and families collection. I am following the muses instructions and choosing subjects from the suitcase of plastic people and animals. I arrange them on my desk and draw and paint them in my Aquabee sketchbook. Painting in the sketchbook which sells for around $14.98 on cheapjoes.com is less stressful than painting on a piece of watercolor paper that costs around $5 or $6 for a 22”x30” sheet. The less expensive paper = a willingness on my part to try out new ideas, different brushes, unusual color combos and concepts I haven’t mastered yet. Did you know if a teacher says to you, “You are a good painter,” you probably will not want to try out any new methods or ideas that don’t guarrantee you decent painting. If a teacher says something like “ You are working very hard at improving your skill at color mixing,( or some other painting skill), you will continue to practice and improve your painting. What do you think? Have you ever had an experience of improvement or unimprovement after a teacher’s comment? *If you want to do some sketchbook practice painting, attend my Miracosta Community Ed Sat. Class that starts on July 14. Its called “Develop the Habit of Watercolor Practice Painting”. See info on class page on this website for instructions on how to register.